ABBOTT MOTORS, An exceptional car buying Experience, is offering this exceptional vehicle for sale. ABBOTT MOTORS has over 50 years of automotive experience! We are also a CARFAX Advantage Dealer. We offer great deals and specialize in FINANCING FOR EVERYONE-ALL CREDIT APPS ACCEPTED! We look forward to helping you purchase your next vehicle. CALL or TEXT (716) 229-5711 for quick answers to your questions about this vehicle. Your message will be answered by a real human never an automated system This Ford includes: XLT CONVENIENCE PKG Steering Wheel Audio Controls Integrated Turn Signal Mirrors Power Mirror(s) Auto-Dimming Rearview Mirror Heated Mirrors Leather Steering Wheel Power Driver Seat Adjustable Pedals Bluetooth Connection Telematics Auxiliary Audio Input MP3 Player 5" CHROME RUNNING BOARDS Running Boards/Side Steps XLT PLUS PKG Sliding Rear Window Privacy Glass Rear Parking Aid Rear Defrost XLT IN-DASH COMPUTER CONVENIENCE PKG Integrated Turn Signal Mirrors Power Mirror(s) Auto-Dimming Rearview Mirror Heated Mirrors Power Driver Seat Adjustable Pedals XLT CHROME PKG Chrome Wheels Tires - Rear All-Terrain Tow Hooks Running Boards/Side Steps Tires - Front All-Terrain TRAILER TOW PKG Transmission w/Dual Shift Mode Tow Hitch 18" CHROME CLAD ALUMINUM WHEELS Chrome Wheels *Note - For third party subscriptions or services, please contact the dealer for more information. * How to protect your purchase? CARFAX BuyBack Guarantee got you covered. 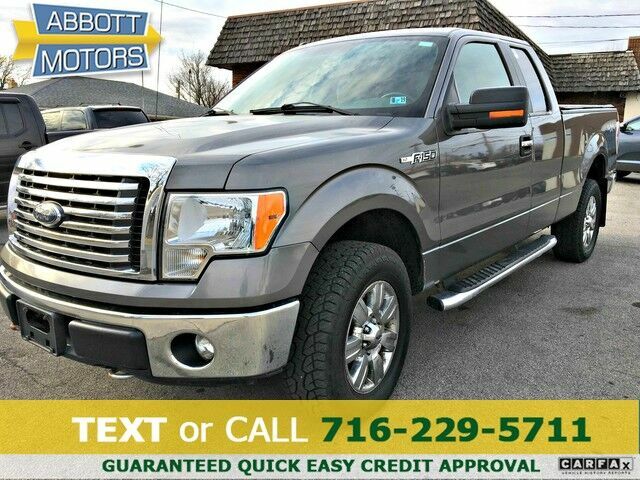 At home in the country and in the city, this 2011 4WD Ford F-150 XLT has been wonderfully refined to handle any occasion. Smooth steering, superior acceleration and a supple ride are just a few of its qualities. Low, low mileage coupled with an exacting maintenance program make this vehicle a rare find. The tires on this exceptional vehicle have minimal wear and look to be nearly new. You demand the best in everything, so why would your automobile be any different? Enjoy the best features available in this stunning Ford F-150. Speed is a game changer and this awesome machine is so fast it didn't just change the game, it rewrote all of the rules. Rare is the vehicle that has been driven so gently and maintained so meticulously as this pre-owned beauty. The paint and body on this Ford F-150 XLT looks as fresh as the day it rolled off the assembly line. This Ford F-150 comes equipped with hard-to-find custom wheels. More information about the 2011 Ford F-150: Ford claims class-leading fuel economy, as well as best-in-class towing and horsepower for both its base V6 engine as well as both of the available V8s. Ford also says that it's the only automaker to offer a 6-speed automatic transmission across its entire model lineup. The F-150 is also the only full-size pickup so far to offer electric power steering, which saves fuel and gives an improved steering feel. Across the lineup, the F-150 carries through with the full redesign that the truck received for 2009; since then, the F-150's very purposeful, upright instrument panel and vastly upgraded interior materials have stood out in this very competitive class. Interesting features of this model are wide range of models for all budgets, tastes, and needs, available luxury features, Smooth, strong new powertrain lineup, class-leading towing and payload capacities, and fuel efficiency STOP IN TODAY or Apply Online 24/7 at Abbottmotors.com ... All Trade-ins Welcome... Same Day Delivery... Call or Text Today and See The Difference... We Look Forward to Serving You! !This vehicle may be subject to potential open recall(s). Vehicle recall information may be found at Safecar.gov. Please verify price, equipment, options and features with your sales rep before your purchase. We Look Forward to Serving You. *Tax, title, plates extra. All Financing On Approved Credit. BBB accredited A+ member.